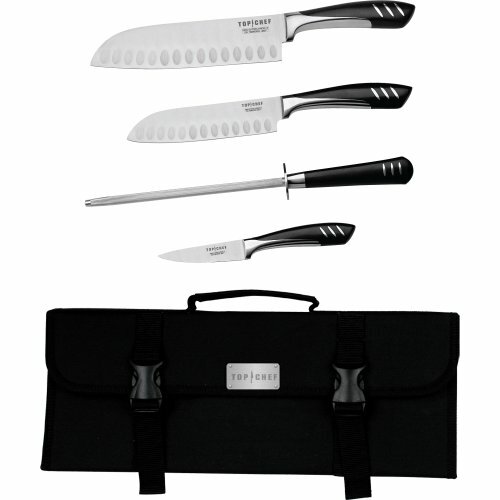 This officially licensed five-piece knife set will have you cutting like the pros. Like those used on Bravo's top-rated Top Chef program, these knives feature an ice-tempered stainless steel blade with precision cut sharpened cutting edge, hollow ground to reduce sticking and a full steel handle with seamless bonded and polished bolsters. Includes carrying case. Product Features: Ice-Tempered x30cr13 Stainless Steel Blades with Precision Sharpened Cutting Edge Hollow Ground to Reduce Sticking Full Steel Handle with Seamless Bonded and Polished Bolsters and Non-Slip Surface Laser Etched "Top Chef" Logo on Each Knife 7 inch Santoku Knife: Blade Length: 7 inches Handle Length: 4.8 inches Overall Dimensions: 11.8 x .6 x 1.85 inches 5 inch Satoku Knife: Blade Length: 5 inches Handle Length: 4.5 inches Overall Dimensions: 9.5 x .4 x 1.18 inches 3.5 inch Paring Knife: Blade Length: 3.5 inches Handle Length: 4.2 inches Overall Dimensions: 7.7 x .4 x .8 inches Sharpening Rod: Sharpener Length: 8 inches Handle Length: 5 inches Overall Dimensions: 13 x .6 x 1.18 inches Nylon Carry Pouch Dimensions: 15.5 x 1.4 x 7.5 inches. If you have any questions about this product by Topchef, contact us by completing and submitting the form below. If you are looking for a specif part number, please include it with your message.